This brand new 3 story chalet has 3-4 bedrooms, 3.5 baths, 2 family rooms and a beautiful kitchen with aristokraft cabinets, granite countertops, ss appliances, island and large pantry. Special features; solid wood doors & trim, wood cathedral ceiling in living/dining room, wood engineered flooring, tile floors in all baths, custom barn door at entrance to 2nd floor family room. This home is a delight to show and is very well built. 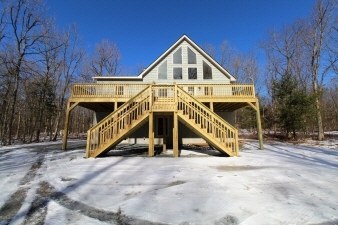 There is also an expansive deck and attached 1.5 garage. Easy to show and waiting for your buyer!